This is same as schema update of server side. How to do that in iOS? You name new version file name(everything is fine, but I recommend to add number or your software version). Next, we change current Core Data file. 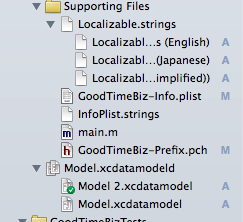 Point your root .xcdatamodel and see File Inspector(default is right side). You can select “Model Version” here. 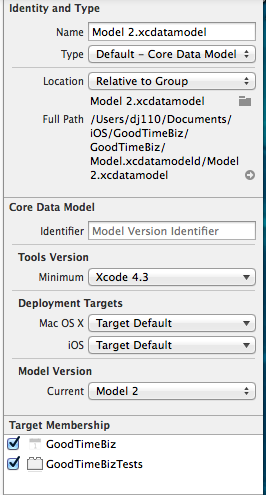 Let’s edit Core Data file for next version. I added new table named “CustomHoliday”. Next is same. 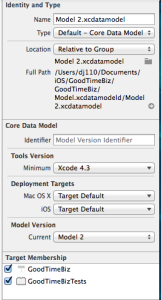 Create NSManagedObject by XCode. Add column and delete column is easy. Almost all same. The most difficult situation is change column data type. In that case, we need to implement conversion code. This is nice description about it!